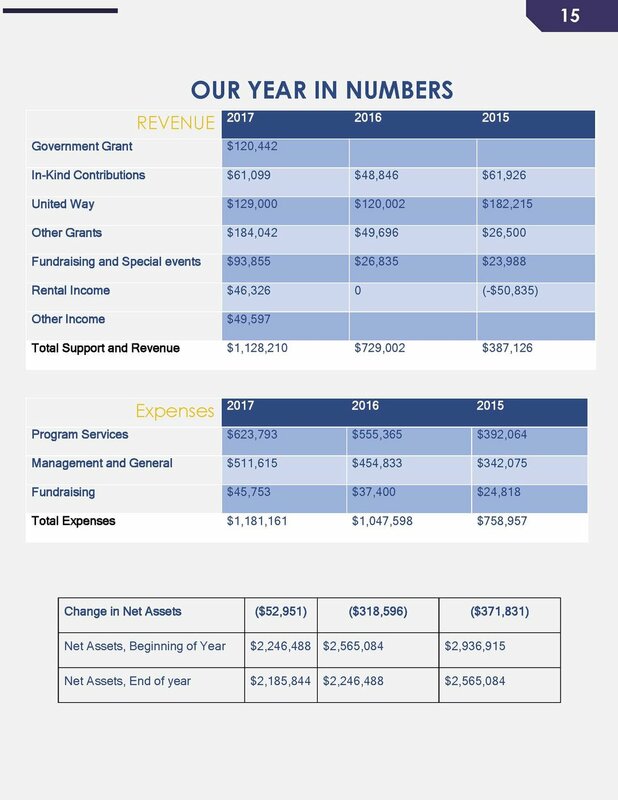 Today, the center’s focus is moving our programming into a direction that embraces the organization’s mission and values, while strategically introduces new and innovative programming for clients to achieve a financially stable environment. 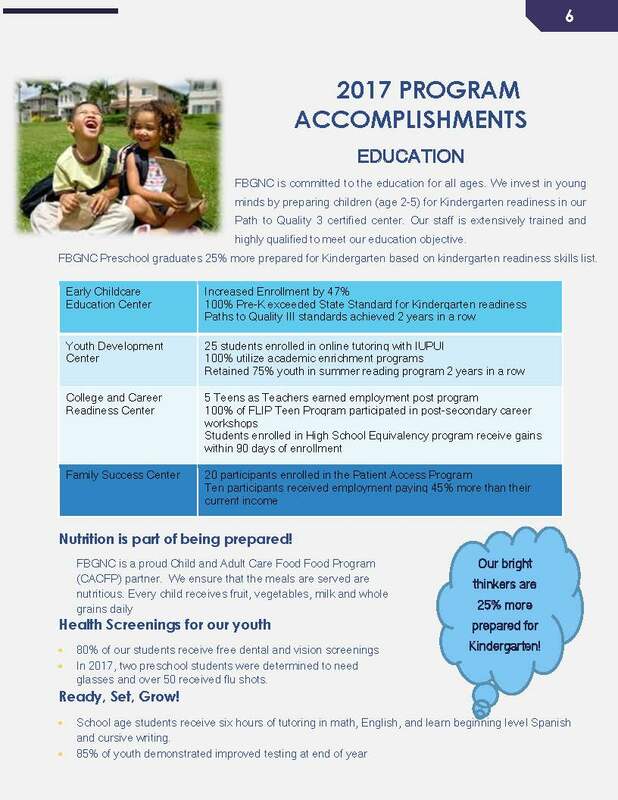 Education: which includes dual language preschool curriculum and certification programs for parents, To date FBGNC Preschool is at 93% capacity with over seven different languages and cultures among our children. Some parents of the preschool successfully completed training certifications with IUPUI. 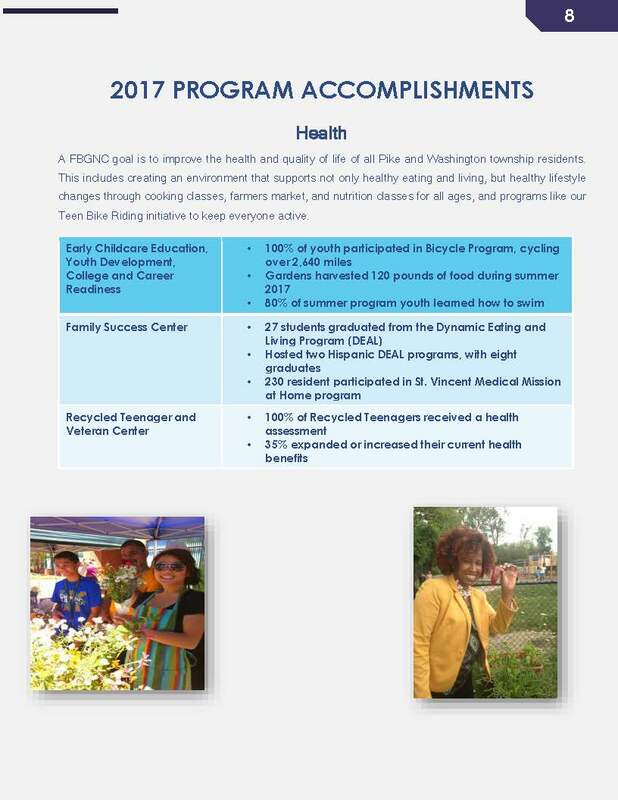 Health: which includes healthy eating and living workshops, cooking classes, and client relationship building with St. Vincent Hospital. The DEAL program has trained over 45 mothers ages 18-30 in cooking basic meals, shopping utilizing coupons, and budget tools to create a meal. Basic Needs: provides food, clothing, and household supplies for families. This year FBGNC provided clients with over 40,000 pounds of food, 125 families received winter clothing, and 500 families received shoes. 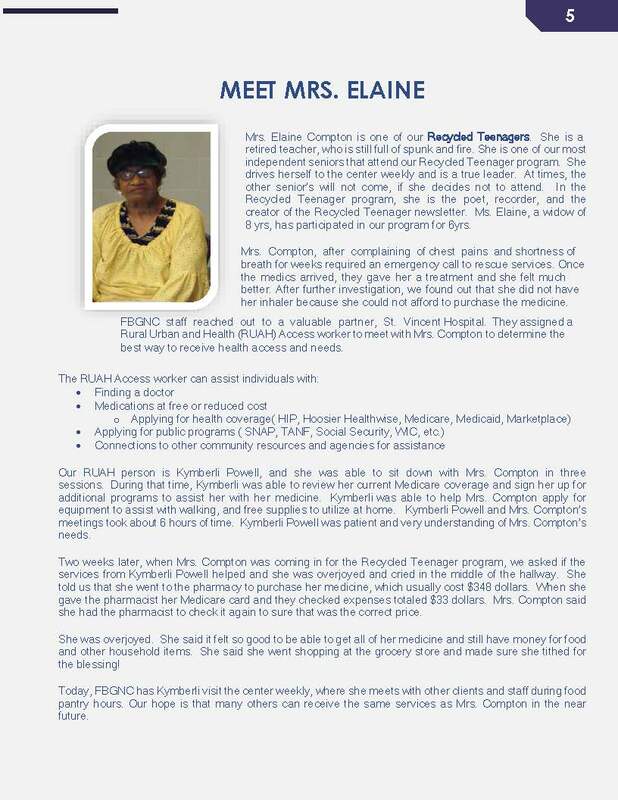 Financial Support: provides budgeting classes, bank and financial institution programs, and employment opportunities. 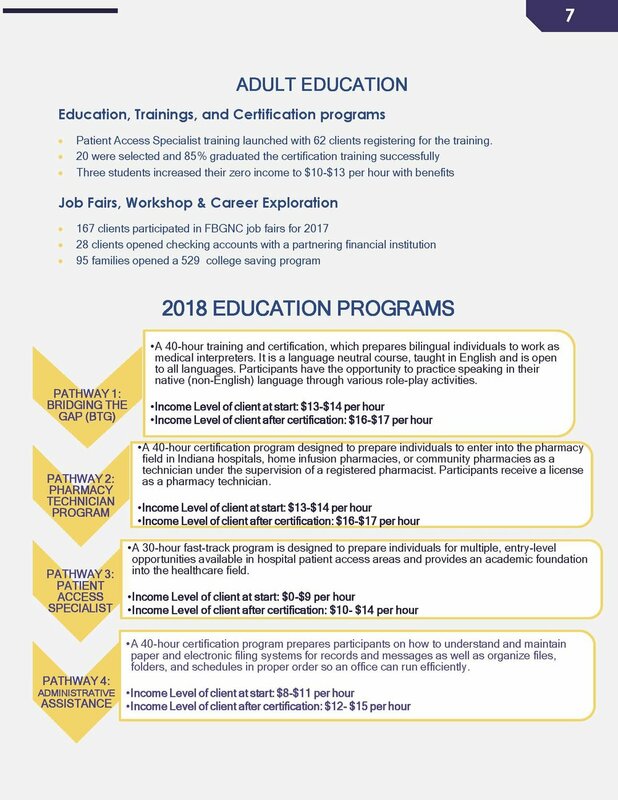 Since 2015, FBGNC has assisted 124 clients open a checking account, 50 families start a 529 college savings accounts, and 231 clients receive employment. As a “Family Campus”, we pride ourselves in creating an environment for the entire family to learn and grow. 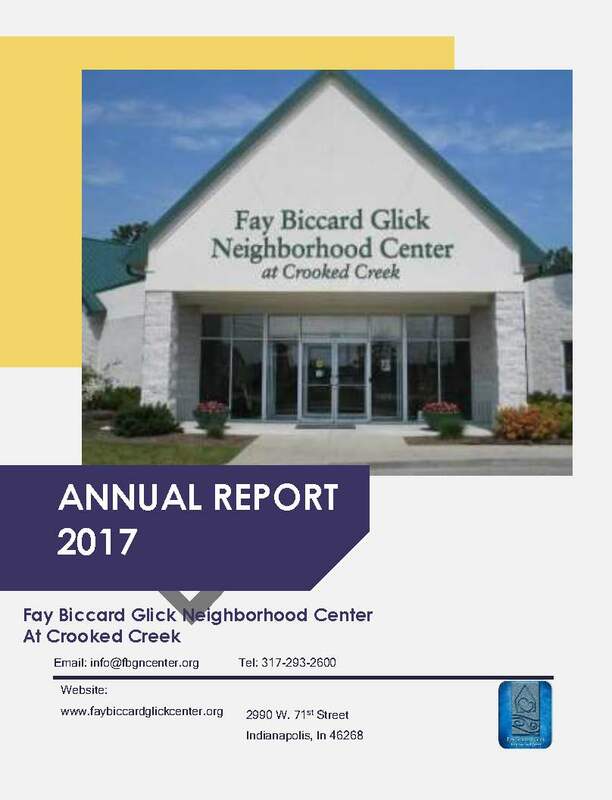 To promote civic, social, and personal responsibility in the Crooked Creek service area by providing quality services that enhance the lives of individuals and families. 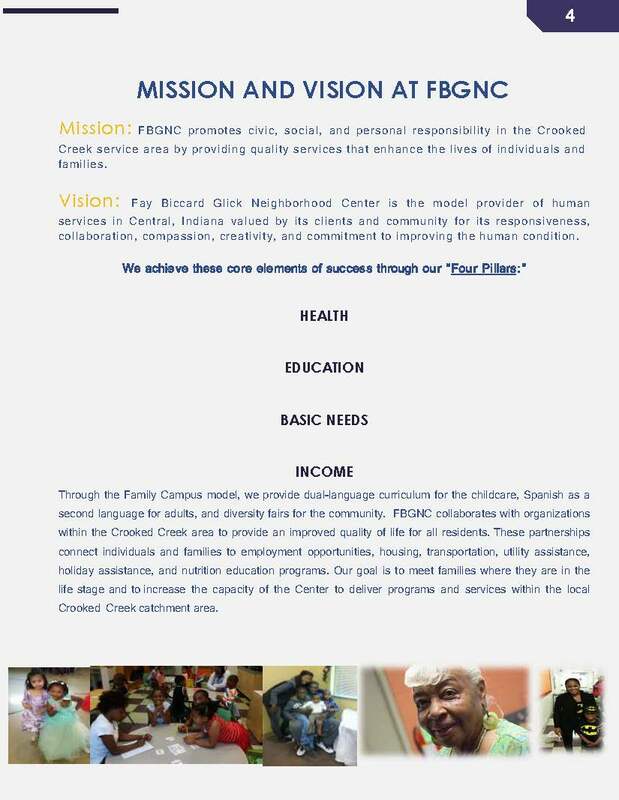 The center has adopted the model “Family Campus” which will focus toward improving the quality of life of clients from cradle to Recycled Teenager (infant to senior) through programs that promote inter-generational engagement, health, diversity and programs for all ages. The Family Campus model will provide dual language curriculum for the childcare, Spanish as a second language for adults, and diversity fairs for the community. FBGNC will continue to focus on improving current programs as well as increasing the number of participants within the Center. 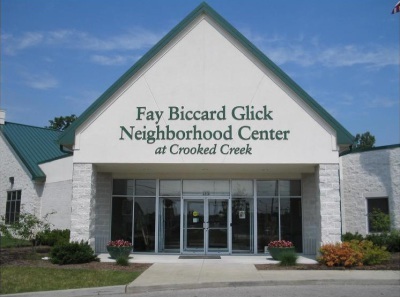 Our goal is to engage in relationships with organizations within the Crooked Creek area to provide an improved quality of life for all residents. 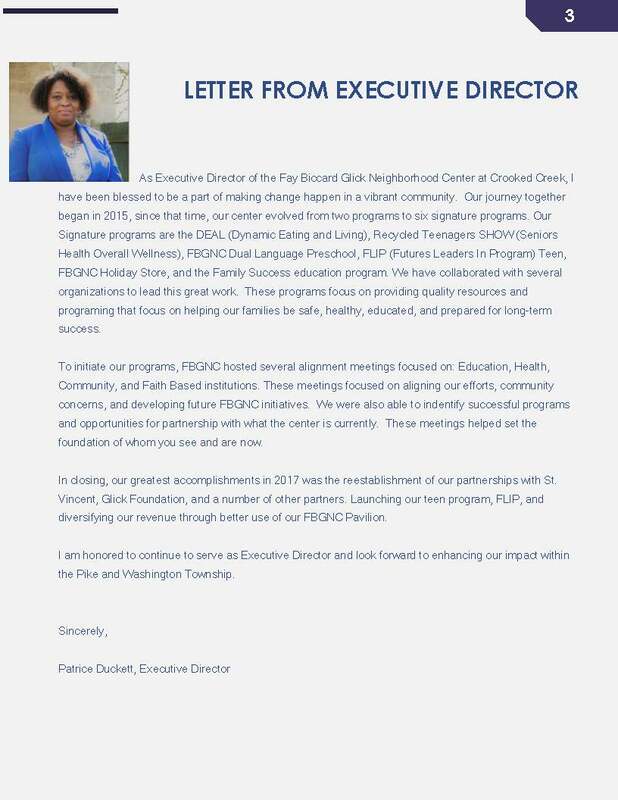 Finally, the FGBNC will increase the capacity of the Center to deliver programs and services to meet the needs of the community that are directly related through resident engagement efforts. 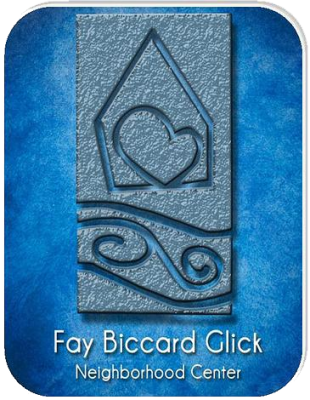 Fay Biccard Glick Neighborhood Center welcomes volunteers! If you, your company, youth group, or sorority/fraternity would like to volunteer at the Center, fill out the volunteer form at this link.